Here at Damn Good Hospitality Group, we encompass three venues under one roof: Stache, Revolution Live, and America’s Backyard. We are a family-owned business that has been a proud member of our local South Florida community for more than a decade. Every day, we look forward to bringing local residents together and encouraging a sense of community here in Fort Lauderdale, whether it’s for a cup of coffee, a night of live music, or a drink with friends. On Wednesday, February 14, 2018, tragedy struck our community at Marjory Stoneman Douglas High School in Parkland, Florida. In the wake of this horrific event, we are honored to bring together supporters from far and wide, primarily to raise funds for those affected, but also to provide a safe night of positivity and music for the entire community. 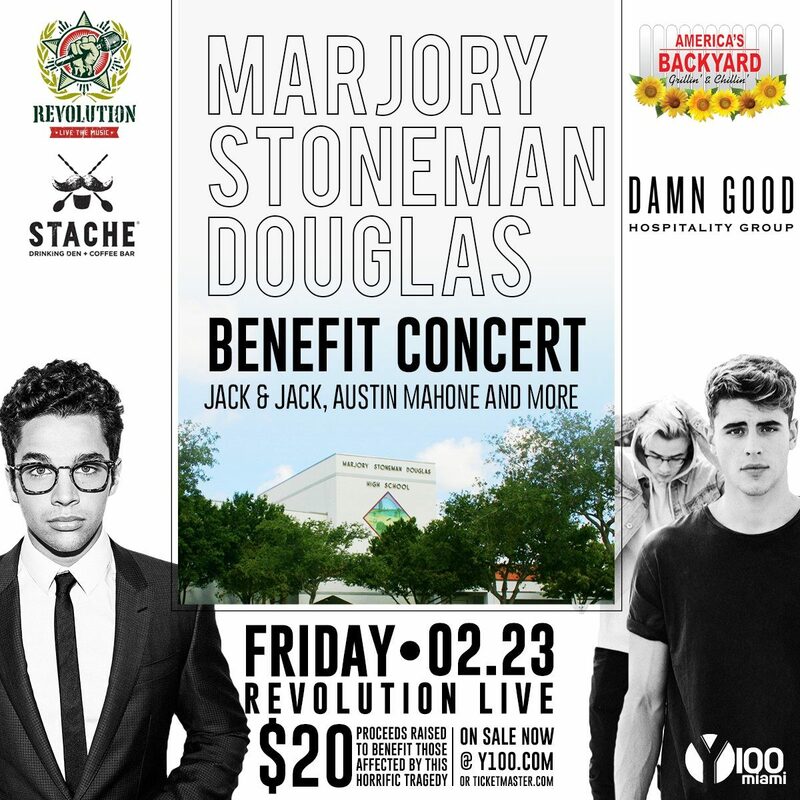 The response to our Benefit Concert, here on Friday, February 23, has been incredible. We have been working tirelessly to respond to all of your remarkably generous sponsorship offers, auction donations, and countless performance requests throughout the past week, for which we could not be more proud and grateful of this local community. On Facebook alone, you have helped us reach over 535,000 people through this event. 100% of ticket sales, donations, and silent auction proceeds, along with 50% of bar sales, will be donated directly to support the families and community affected by this tragedy. All funds will be retained by our attorney, in the Kopelowitz Ostrow, P.A. trust account, and subsequently distributed with the guidance of our Downtown Fort Lauderdale Community Advisors. Thank you all for your incredible display of support in response to this tragedy. We hope you are all able to join us this Friday in bringing together our local community.